Peanut butter is the boss’ number one cookie pick, but we tend to nibble on the Chocolate varieties. It’s dangerous being so close to these made by French Chef Jean-Luc at Le Petit Cafe and Bakery! Plus the desserts are outta this world! Grab and go with a selection of brownies, muffins, and other pastries from Coffee Dock and Post. 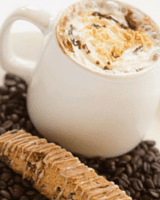 Be sure to get your caffeine fix with a caramel latte or a vanilla cappuccino… or any other favorite concoction that tickles your fancy. 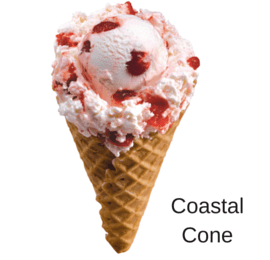 No need to scream, Coastal Cone has you covered. Whether you prefer a sugar cone, a sundae or a double scoop on a hand rolled waffle cone, you’ll be stoked with a pit stop here. Homemade fudge in a variety of creamy flavors like cookies-n-cream, mint chocolate swirl, peanut butter chocolate, butter pecan, maple nut, and Heath English toffee chunks. 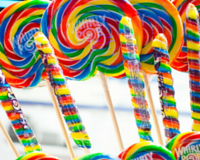 Find these and a full candy counter at The Village Carousel & Arcade.